This is one of my favorite salads ever. 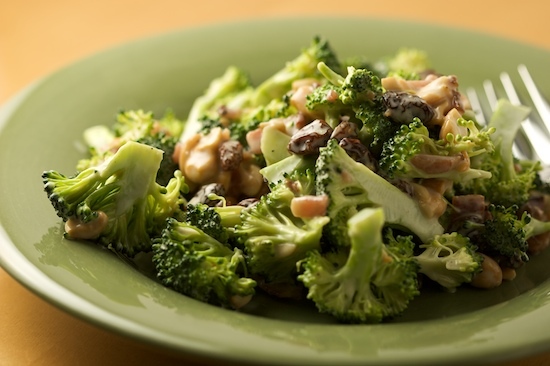 It combines all of my favorite things: broccoli, bacon, raisins, and cashews! How can you go wrong with that combination? I even had a hard time taking the photo because I just can’t stop eating this salad once it’s put together. I just remembered that I made this salad last year for Thanksgiving. It’s getting close, but I decided to throw it up here in case there are any other procrastinators out there looking for last minute Thanksgiving side dish ideas. It really is simple enough to throw together at the last minute! 1. In a small bowl, whisk together mayonnaise, brown sugar, and vinegar; add salt and pepper to taste. 2. In a large bowl, combine broccoli, bacon and raisins. Add dressing and toss well. Store, covered, in refrigerator until ready to serve. Stir in cashews just before serving. *Because the broccoli isn't cooked, be sure to cut it into very small florets. If you prefer to stay away from raw broccoli, the florets can be blanched (boiled or steamed for only a minute or two until broccoli turns bright green but is still crunchy) before the salad is made. I don't normally use the thick stems, but others have suggested peeling and finely chopping the stems for the salad, so I'll try that next time. **You can add chopped red onion to the salad for a big boost of extra flavor if you like raw onions in salad - it's also good without. ***As other commenters have pointed out below, sunflower seeds can be substituted for the cashews if that's what you prefer. There are several variations of broccoli salad floating around out there, feel free to create your own! this looks wonderful. I think it would even make a nice salad to take in my lunch during the week. Definitely marking this one to try! Oh thank you, thank you for this recipe. I have loved this salad for a few years now trying to figure out exactly what was in it. I haven't attempted your recipe yet but I already know it's going to be delicious. A friend of mine just made a similar salad for me for dinner (along with a simple grilled chicken), and I couldn't get enough of it. I like the idea of adding some red onions. i love this salad! i was just looking for a recipe for this today! no joke. thanks for posting it. Looks good! Great veggy dish....tried something similar once......it had walnuts and blue cheese. Nothing is more healthy than broccoli. LOVE it! david's family introduced me to the wonderful world of broccoli salad last year, this looks so good! I love this salad! Also a fan of it from Sweet Tomatoes. I recently made a bunch of recipe cards for a wedding shower gift. I knew the bride would love this, so I went in search for a copycat recipe (which I never do). One thing different in their recipe, which I think makes a huge difference, is they blanch the broccoli. That explains why th Sweet Tomatoes version has no trace of bitterness. It's not necessary, of course, but I think blanching would be worth the extra bit of effort. This is my favorite salad ever. I have it on my list of things to make for tomorrow. I make a similar version of this, but use sunflower seeds in place of the cashews. It is SUCH a great dish---I usually make it a lot at summer get-togethers. For some reason I never thought about serving it at Thanskgiving, but it is a great do-ahead side dish. Have a happy one! Nicole! This is lovely! Fresh! And I digg your photos! Aunt Lolo: Thanks for the tip on using the stems, I'll try that next time and I just added a note to the recipe! Vanessa: I hope you enjoy it! Susan C: I can't agree with you guys about the red onion, but I just added a note to the recipe that it can be included. I just can't stand raw onion :-) Alicia: Well sounds like I posted it at the perfect time! It was totally spur of the moment! :-) Jesse: Yes, lots of people love red onion in this salad (not me)! I think you should stay away from the garlic in this one, though! I'm not sure about substituting something else for the mayo. I can't stand the fat free stuff so I just think of this as a 'special occasion' salad and make it the super fattening way! Everything in moderation, right? But we'll see if anyone else has suggestions for you! Icelandicchef:I think blue cheese would be AMAZING in this salad! I'm trying that next time! Debbie: I think sunflower seeds would be great in this! I just added a note to the recipe saying that they can be substituted for the cashews. Thanks! Amy: I know, it's so good! I just ate some for breakfast (after the pumpkin spice cake). Robin: You're right, some people do prefer to blanch the broccoli for this type of salad. I happen to love raw broccoli as long as it's chopped small and have never noticed any bitterness, but I'll add a note about blanching for those who might disagree :-) Leaca:Is your recipe similar to this one? I think it's a great addition to the Thanksgiving table! The Secret Ingredient:Debbie mentioned the sunflower seeds too so I'm definitely gonna give that a try sometimes. It is definitely a great year-round salad! ttfn:There are so many versions of this salad floating around! But of all I've tried, this is the one I like the best :-) Gabi: Thanks so much! Nicole: I love this salad and it is my youngest son's favorite. For a little different texture, I've also used the "broccoli slaw" that you can get in bags at the market. Delicious! BTW, those Sweet Potato Buttermilk Rolls are truly amazing. They will be a big hit tomorrow! GENIUS adding the cashews, I love this salad but have never thought to add them. It is seriously all of my favorite things together! I add halved red grapes to this salad, they go well. If you want to cut calories and fat a bit, substitute nonfat, unflavored yogurt for half the mayo. That's the version of the recipe my friend Vicki gave me & it's great made that way. I do a version of this salad, using 1/2 the fat mayo and Pecans and raisins. Some of my broccoli bolted on my over the weekend. Do you think broccoli flowers would make a good addition?